2015: I'd like to thank Joel Jacobs for the story to accompany this card! The party was in full swing. The children were dressed in the costumes of their favorite characters: action figures and princes, monsters and queens. Even the adults wore getups from movies and history. There were decorations everywhere. A bonfire in the ring in the center of the yard had captured everyone's attention. There was dancing and singing to music. Earlier, the family had bought pumpkins at a roadside kiosk. They carved them, but after acquiring a face, it was discovered that one had a rotten bottom. It was cast aside amongst the garden tools and the leaves swept against the latticework. Now, the wick within it ignited. The light grew dimmer. The candle burned brighter. 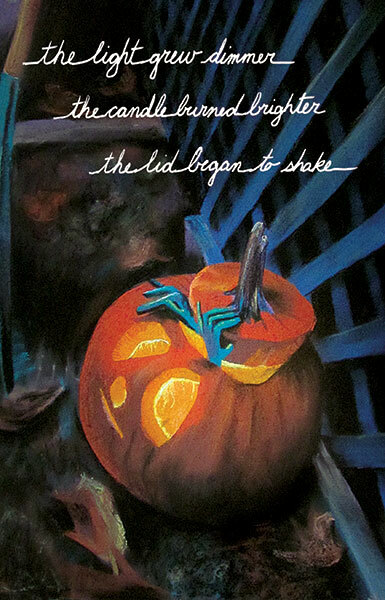 The lid began to shake. Tiny green fingers emerged, and then a creature—thin and humanoid, with orange eyes and a devilish grin—slid out like a moth from a chrysalis. It stood, and prancing to the beat of the music approached the revelers. They walked back to the jack-o-lantern, the old man shrinking down to Jackie's size. They climbed into the pumpkin and replaced the lid. The candle fluttered and went black.